"my Áura" as the word suggests, is an image or reflection; 'my Áura' provides a complete solution in creating an impressive, everlasting image of an individual and organization. 'my Áura' is an evolving front runner in the field of image management with its diverse and efficient team. We specialize in complete image analysis, verbal non-verbal communication skills, etiquette, professional dressing and business consultation. We conduct seminars, presentations and workshops are which very comprehensive and structured with real life applications. Ruchi started “my Aura” Finishing School, first of its kind in Ahmedabad; a unique place for individuals of all the age groups; to help them transform and make their dreams come true while climbing the ladder of success. Life is a school of live experiences and none of us would agree on that we are perfect and have nothing more to learn. “my Aura” Finishing School makes you learn what schools never taught you. So it’s back to school for grownups and second school for children; leading to finer learning, social grace, etiquette, manners, cross cultural protocols, soft skills to present your best to the outside world. Ruchi Sharma is an internationally certified Image consultant, Personal Branding Mentor, corporate trainer, speaker, and author. 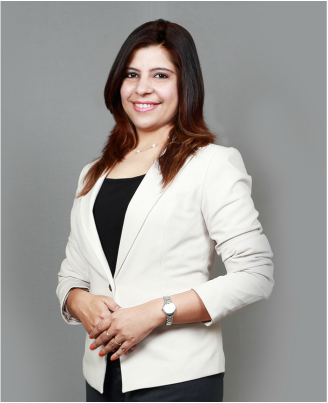 Ruchi founded my Aura Business Consultant in 2007 to become one of the few consultants to bring in the concept of Image Management and Branding to India. Ruchi is a highly dynamic, pragmatic and professional relationship building expert; helping entrepreneurs, leaders, professionals, managers and executives to succeed by guiding them on authentic relationship building skills. She also helps them in communicating their personal brands when networking to generate referrals, find opportunities and influence others. She is associated internationally with multiple accredited associations of Image Consultants. She has been one of the few Associate members of AICI & Coaches Association of India. She has been trained by an internationally renowned US based Image Consultant and Trainer Rena Trepanier, having 20 years of vast experience in image management and consultancy.